​Irish Bells, Wood; 20" x 7" x 7"
​My sculptures are constructed principally from cherry and black walnut hardwoods; utilizing conventional woodworking tools, a great deal of hand sanding and a strong reliance on self-developed techniques used for seamless joining. Functionally, the two species exhibit comparable workability conducive to reliable assembly. Aesthetically, the two species complement each other, allowing me to paint with light and dark tones. My work communicates a strong emphasis on design, derived from my past profession as a mechanical design engineer. Each piece is meticulously planned out in advanced, allowing me to formulate solutions with great confidence and with impeccable accuracy. My greatest reward is a sophisticated admirer’s wonderment as to how my works of art are constructed. While continually building on mastered achievements, each new creation hopelessly requires that I challenge myself by introducing processes, techniques and shapes that have yet to be experienced. This compulsion to constantly test my capabilities is what drives and inspires me to grow as an artist. The resulting collection of projects is truly unique in form, yet maintains a clean sophistication true to my reputation as a respected designer. ​A self described perfectionist, Rich expressed his creative side as a youth by drawing in pencil, winning a Gold Key award in high school. Then, by chance, he was introduced to mechanical drafting, which was embraced as a new art form and showed the way to his calling as a mechanical engineer. For 25 years, Rich expressed his artistry through his drafting while becoming an accomplished designer holding numerous U.S. patents; his career culminating in building his own business designing and manufacturing fiber optic components. 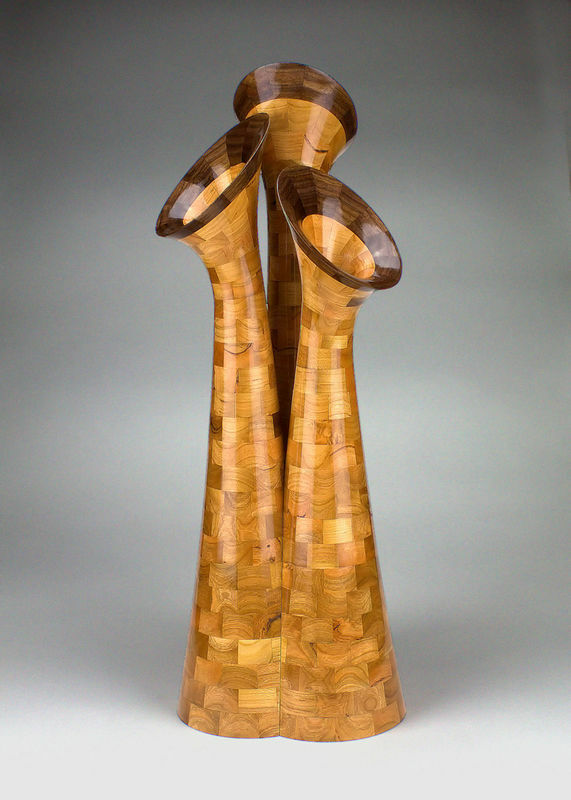 Now as his business retires, Rich focuses his design and creative energies on hand crafting fine art sculptures from wood. Rich’s creations are constructed principally from cherry and black walnut hardwoods; utilizing conventional woodworking tools, a great deal of hand sanding and a strong reliance on self-developed techniques used for seamless joining. The resulting collections of projects are truly unique in form and maintain the clean sophisticated style symbolic of the reputation he developed as a respected design engineer.